Use .820 Elbows to make 90 degree turns in 3/4" drip poly tubing (.820" OD), and or .82o soaker hose. Poly tubing can kink if you try to make a tight turn without an elbow. Compression fittings require no glue. 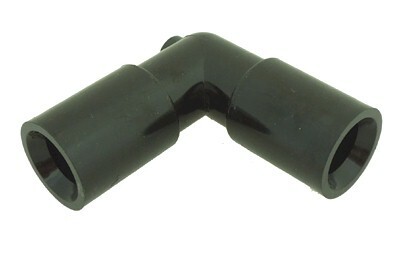 Compression end (black ring stamped 800) accepts .800-.830 OD drip tubing, soaker hose.